Graduation rates in the Long Beach Unified School District increased for the fourth year in a row, again surpassing state and county rates. Students of color in Long Beach schools also outperformed their peers countywide and statewide, according to 2014-15 data released today by the California Department of Education. Six high schools here reported graduation rates above 90 percent. 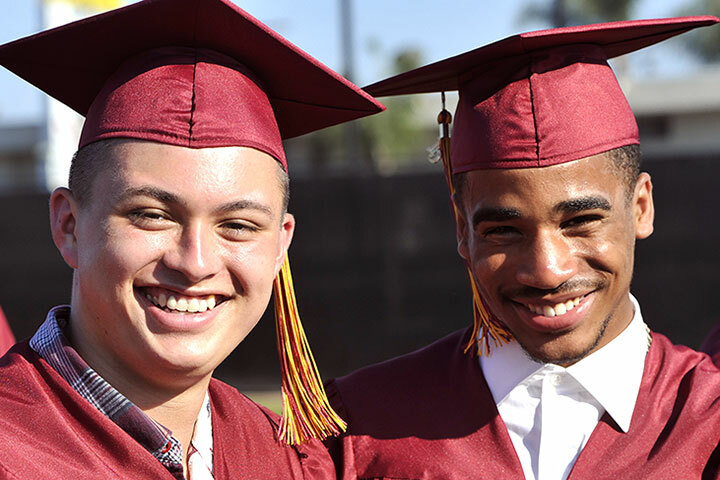 LBUSD’s overall graduation rate is 84 percent, up 3 percent over last year and surpassing both Los Angeles County’s rate of 78.7 percent and California’s rate of 82.3 percent. The six high schools now posting graduation rates above 90 percent include the California Academy of Mathematics and Science, along with Lakewood, Millikan, Poly, Renaissance and Wilson high schools. Avalon K-12 School’s 87.9 percent rate and Cabrillo High School’s 87.4 percent rate surpass state and county averages, while Jordan High School’s 77.8 percent rate was less than a percentage point below the county average and 4.5 percentage points below the state average. The school district’s African American and Latino students outperformed their peers at the county and state levels. The African American graduation rate in LBUSD is 82.5 percent, far surpassing both California’s rate of 70.8 percent and Los Angeles County’s rate of 69.9 percent for the same racial/ethnic subgroup. LBUSD’s Latino students graduated at a rate of 81.4 percent compared to the state’s 78.5 percent and the county’s 76.1 percent for the same population. Latinos, African Americans and whites represent the three largest groups of graduates in LBUSD. At several LBUSD high schools, Latinos now outperform their white counterparts in terms of graduation rates. Latinos, who are by far the largest ethnic subgroup in the school district, surpassed white students at Avalon, Cabrillo, Lakewood and Millikan high schools. At Wilson, the graduation rate for white and Latino students was exactly the same at 91.6 percent. View the full results at the California Department of Education’s DataQuest website. GRAD RATES RISING - Members of the Wilson Classicial High School Class of 2015 celebrate at last year's commencement ceremony. Wilson is one of six schools here to post graduation rates above 90 percent.